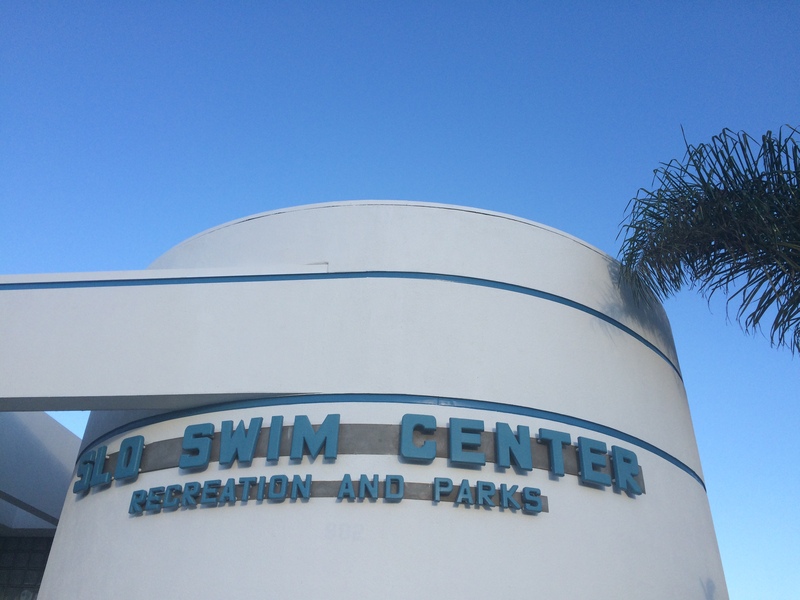 It is a brisk afternoon and I am heading down to the local pool for my next swim (SLO Swim Center – ). I am excited to jump feet first into the pool to cool down, get some exercise, and just enjoy the water. Swimming has become one of my favorite activities and jumping in the deep end of the pool during a warm California afternoon just makes my day. I have been coming to this pool for the last few three years and currently swimming 2-3 times a week. What is driving me to continue to come down to the pool day after day. Backing up to the start of 2016 there was a new poster at the pool entrance describing a 100-mile swim challenge. 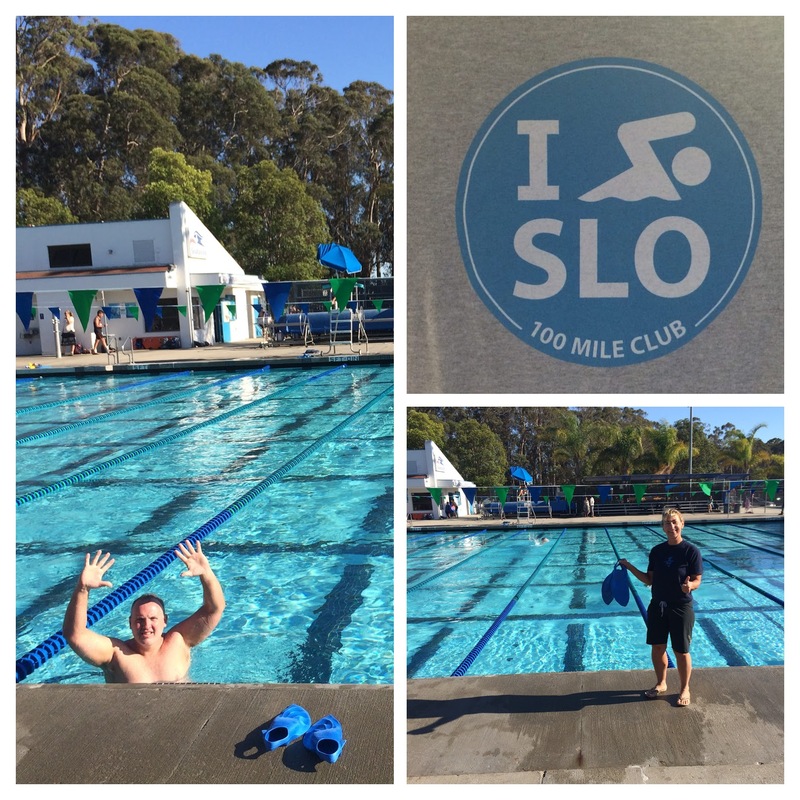 Each time people finish their swim for the day we log our distance, and once we complete the 100 miles the pool recognizes us and we also get a cool “SLO 100” t-shirt. I was a little hesitant to do the challenge by myself. I talked with fellow Flavor Team member Kara and we joined the 100-mile challenge. And so it so began. 1) Always to know your target outcome in as much detail as possible. To me that outcome was pretty clear. I wanted to hit the 100-mile goal. I did research into how long the pool was calculate how many length and laps it took to hit a mile (36 laps in the short direction @ this pool). As I work in the corporate world I put together a spreadsheet (we use spreadsheets for everything) and setup an estimated schedule, # of laps per month, and put together then plan. 2-3 times a week at minimum of a mile each time I would hit my goal. Easy right…..
2) Know your reason why. Humans do amazing things when you know why. Next to really understand and motivate myself to get and head to the pool each week I looked at my own “why”. Why did I want to swim the pool over and over and over, etc. For me it really came down to two main reasons. First, I have already come to love being in the pool and swimming. I feel great afterwards, and that comes with other great benefits primarily great exercise, stress relief, and low impact to my joints. Even though I understood my “why” I really thought about it before really committing. This still holds true after three years and if you are doing something for the right reasons it does not seem like a chore. Here with the known outcome and why I wanted to commit to this goal I now had to take action. As some life coaches say don’t just take action, but take massive action (10x booya! | just do it!) I personally tend to over commit in the beginning and wanted to start strong. I made the schedule part of my life and worked my weekly schedules around my new swim schedule. Another thing I did was plan one of my swim days to include my son. We swim about a mile during our session, and for me this feels great on multiple level. I can experience my journey with him as well as good exercise for both of us. For the last three years I have been able to maintain a good pace and keep my schedule. Yes, it sometimes changes slightly, but I always come back to the pool. Another major activity that is part of life is as a martial arts instructor (Kiryu Aikido). In my 35 years of practice in Aikido I have seen 1000’s of times where people have a strong start to their goals, but if they do not make the practice as part of their schedule ultimately life and excuses will always, always win out (always). 4) During the journey keep track of your progress, celebrate your milestones, and don’t forget to praise yourself. 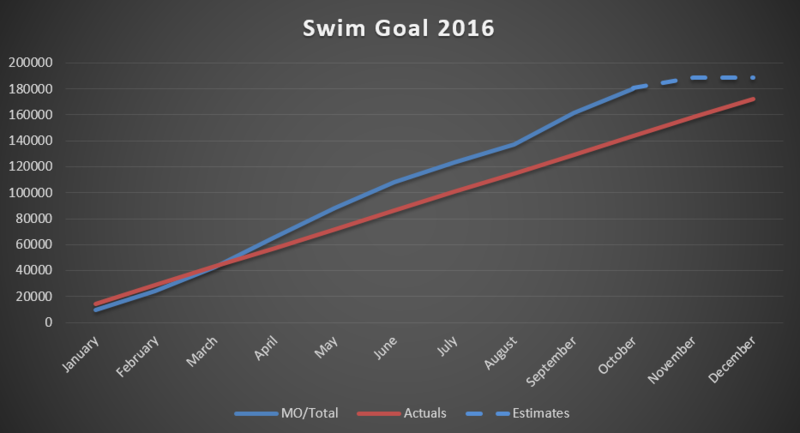 Each swim session I logged my laps and distance with the local pool and also followed up with my own tracking tool. I logged my month to month distances in relation to my goal. I could see my progress against my initial goal. Celebrate your successes. When Kara and I both hit our 50-mile (halfway mark) milestone we had a great celebration some friends and family on Pismo Beach. 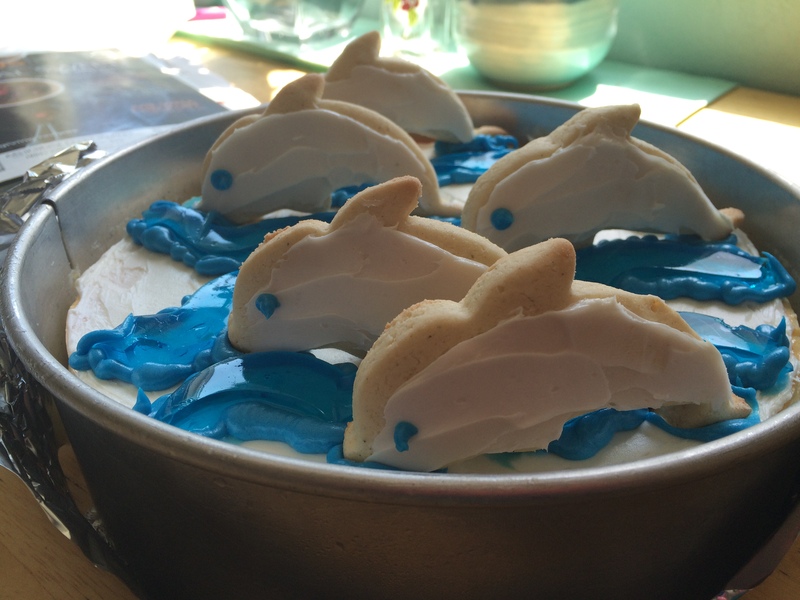 Kara even made some awesome gluten free dolphin cookies!! It is now almost 2019 and we have both hit our 100-mile goal constantly. As I have continued to stay committed to the goal, and the process, throughout this year swimming has become more part of me. I truly enjoy and crave going to the pool. I am enjoying the journey and curiously the 100-mile goal is now just a (yearly) milestone to me. I can’t see myself slowing down anytime soon, and will continue to swim and enjoy our central coast lifestyle. I have met many people at the pool so excited and enjoying the challenge themselves and we all help and push each other when we see each other towards those goals. Who else is ready to challenge themselves (and US) for the next year. Comment and give us a shout out.